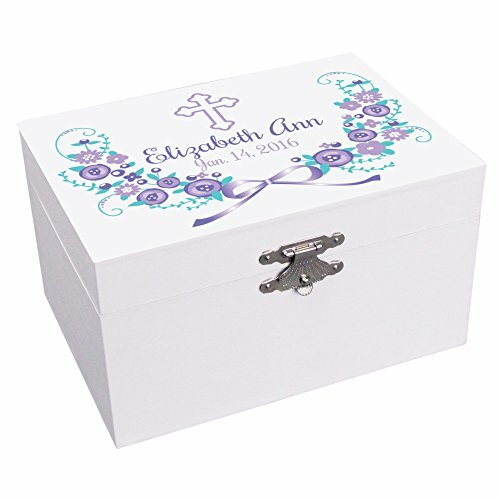 Personalized Baptism Lavender Garland Jewelry Box Ballerina Musical Plays "It's a Small World"
Thank your precious Flower Girl with a Musical Personalized Baptism Lavender Garland Jewelry Box. This jewelry box is a replica of the ones we remember as a little girl. Ideal sized for child's first jewelry box and a personalized keepsake. Musical Wind up - Plays "It's a Small World"
Measures 6" x 4 1/4"
Special Woman - Matthew 5:16 - Numbers 6:24 Tabletop Tray, 7" X 5". AT001 Grateful, Thankful, Blessed Tabletop Tray, 7.5". AT001 Trust In The Lord With All Your Heart - Proverbs 3:5 Tabletop Tray, 7.5".